The SUNY New Paltz Department of Black Studies and the Black Studies Student Organization have collaborated with faculty and the staff of the Sojourner Truth Library to assemble an exhibition dedicated to the history and future of Black Studies at New Paltz. 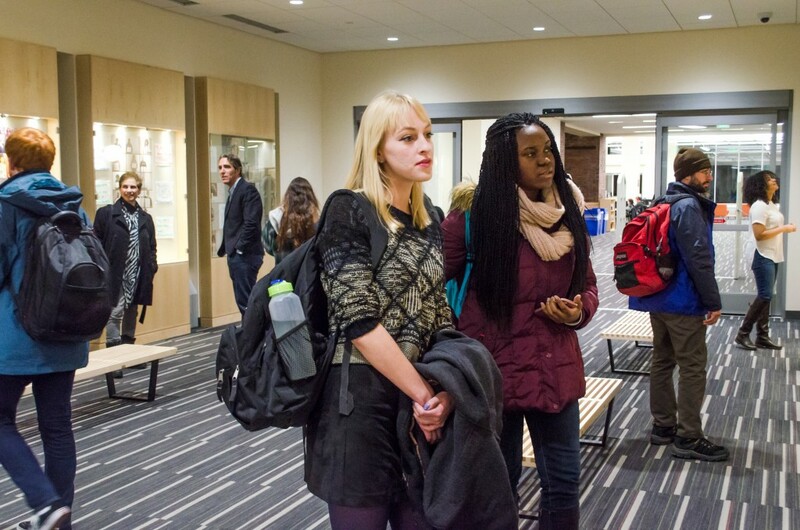 The exhibition opened on Feb. 10 with an evening program in the Library lobby and reception area, featuring a panel discussion between student and faculty exhibition curators and a guided tour of the new displays. The panel was moderated by Kimberly Roman ’16 (Early Childhood Education – Black Studies B-6) and included students Jean Padilla ’16 (Sociology – Criminology), Rosa Rosario ’17 (Black Studies, Sociology) and Nicole Striffolino ’16 (Graphic Design). The panelists were joined by new Special Assistant to Black Studies Anthony Winn ’92 (Business Administration). The Black Studies exhibition is currently open to all community members. It includes displays celebrating the history of the Department of Black Studies, the history of student activism on campus, the life of former Black Studies Chair Margaret Wade-Lewis and the many faculty publications and other recommended readings that have underpinned the curricula over the years. The students were assisted in compiling the exhibition by Assistant Professor of Sociology Alexandra Cox and Reference Librarian Heather Shimon. While the students had faculty and staff support, it was ultimately their enthusiasm for the legacy of Black Studies at New Paltz that led to the creation of this event and exhibition. More information about the Department of Black Studies and about the tradition of Black Studies at SUNY New Paltz is available online.